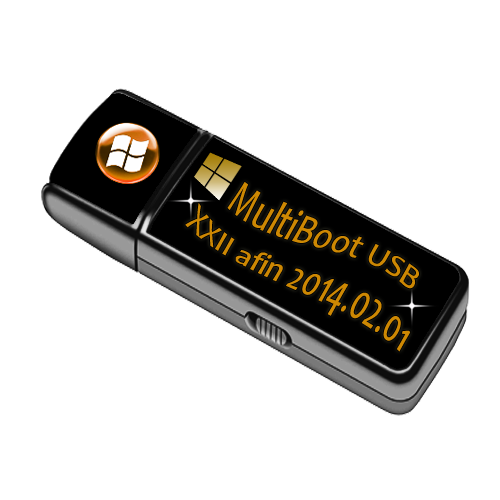 Сейчас вы просматриваете новость MultiBoot USB XXII Afin :February.10,2014, данная новость входит в категорию Софт в которой вы сможете найти все по теме данного материала. Multiboot USB-Flash Drive for service , backup, restoration of the hard disk, the treatment of viruses, reset the "forgotten " passwords, etc. As part of the archive: file MultiBoot.img - image flashes , made ? ?by the utility USB Image Tool 1.64; USB Tools folder has a set of required tools and instruction to build multiboot stick . On a flash drive folder contains utilities _QEMU MobaLiveUSB v0.2 MobaLiveCD_v2.1 and testing a bootable USB drive . Attention! Program of MultiBoot USB is not installed or run from the operating system! 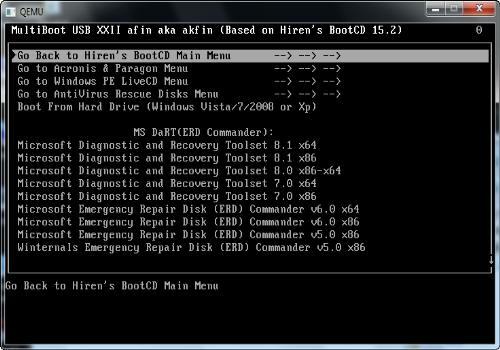 The exception is Startup Tools from the Hiren's Boot CD and portable program from the folder User_Files. - Hiren's Boot CD 15.2 - in full ( Keyboard otpatchena for Russian) . Hiren's BootCD - stunningly competently and professionally assembled, the most popular boot "all-in -one" disc , literally everyone , including administrators and administrators for the repair work on the computer . - Ultimate Boot CD 5.2.8 - boot disk for diagnosis and recovery system with the ability to use the LAN. Contains a large number of applications for all occasions - anti-virus and anti-spyware , programs to work with CD and hard drive for backup and restore the system to work with files and system registry to collect information about the system , etc. - SystemRescueCd 4.0.0 - recovery disk , based on Linux and is available as a bootable CD / DVD- disk or USB-stick for the administration and restore system and data after a failure. Tools for working with hard drive : partitioning, diagnosis, preservation and restoration of sections. Able to mount partitions Windows Ntfs to read and write . Also provides a means to configure the network , network services , search tools, rootkits and antivirus. Can be downloaded from the CD-ROM , USB- drive , or network protocol PXE. - Parted Magic 2014_01_04 - Live- specialized system for managing disk partitions. - FastStone Capture 7.6 - a program for taking screenshots . computer that supports booting from USB, RAM 1 GB (or more).